1: Inspect and assess the deterioration of the textblock and binding. Work with the major motive in your head to make the book usable and durable without losing the feel and handle of the original. Try to not add any stress to the opening and flexibility of the binding. 2: Generally remove textblock from case by cutting along joint edge. If ends are intact then lift them off the textblock and then cut along joint. 3: Clean off spine removing all deteriorated glue and check sewing structure, if the spine lining and the spine of the textblock look sound then maybe leave the old spine lining. 4: Textblock consolidation can run the gamut from resewing to reinforcing weak sewing or strengthening the first and last signature. Type and condition of textblock will generally spell out your options. 5: Attaching original flyleafs or adding new ends are options that will vary from book to book. For joint attachment I generally prefer japanese paper combined with the spine lining of linen. Attachment of endpapers to textblock will again be determined by the condition of the textblock e.q. if paper is brittle then wrapping japanese paper hinge over shoulders of the spine. See diagram # 1. 6: Consolidate the spine either with a paste and PVA mix or the reversible PVA. I generally attach the linen prior to resha ping of the spine as I think it helps to protect weak paper from the backing procedure. Be soft with the hammer. 7: Attach the second lining so as to assist in holding the shape. Generally I damp the second lining very lightly prior to attachment. It seems to dry more taut. 8: Now tackle the case. Trim off all excess material on the spine edge of boards. Cut original case about 1/32" from the spine edge and remove excess. Lift original cloth from board approximatively 3/4" from edge. 9: Lift endpaper if desired approximately 3/4" from the spine edge also. 10: To alleviate the lump that show sometimes under the cloth from the new spine strip, I sometimes remove excess board using masking tape as a means to remove evenly a small amount. Generally about 3/8" from the spine edge. 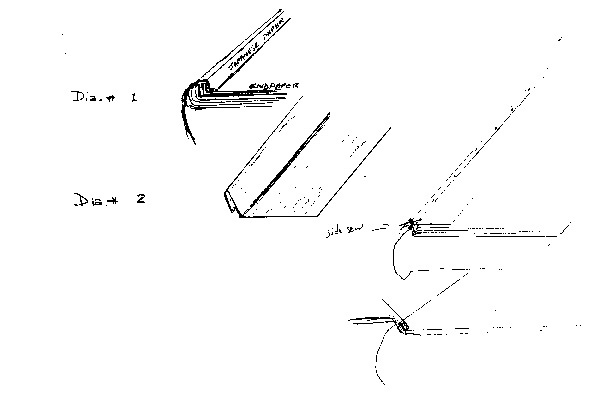 Use the handy gadget shown in diagram # 2 to hold cloth out of the way while working ; it also stops from creasing the cloth where you have lifted material. 11: Cut spine linen for case; I sometimes use blotter paper as it is more sympathetic for shaping. 12: Select japanese paper so as to color match original cloth and attach to a piece of linen. Sometimes dying of japanese paper will assist in achieving a better match. After trimming to size I coat paper with an acrylic wax to harden the surface of Japanese paper. 13: I generally attach new japanese paper/linen sandwich to the front board first then attach spine inlay in exact position. Remember the gap between spine and board varies if it is a tight joint or french joint originally. 14: Cut new spine to exact width and attach to back board. 15: Apply adhesive to a polyester film strip and slip under original cloth and rub down and then slide out polyester film. Tap down cover carefully. 16: Case in either using new ends or fix linen hinge. 17: Attach old spine and rub down carefully.